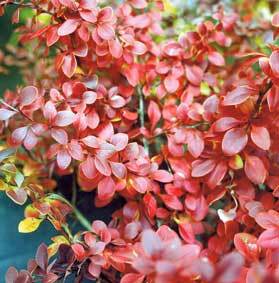 Berberis is one of the world’s most successful plants. It is vigorous, easy, and virtually indestructible – and there are many varieties to choose from. There’s one for every kind of garden, from large, elegant arching shrubs like ‘Pirate King’, to neat little mounds like ‘Tiny Gold’. Narrow, upright ‘Red Pillar’ can provide useful year-round structure in the smaller garden. Deciduous berberis do best in an open, sunny position, though the evergreens and golden forms appreciate some shade. Vigorous types like Berberis darwinii make excellent boundary hedges and windbreaks, while dense, small-leaved varieties respond well to clipping. And don’t forget the value of berberis in the wildlife garden: the berries provide food for birds and small mammals, while the flowers are a vital early food source for our endangered bumble bees.